1) What do you mean by Access control techniques? Access control techniques define the ways to implement access control mechanisms. 2) What are the types of Access control techniques? 3) What is Discretionary Access Control – DAC? In DAC the access to a resource, say a file is controlled by the owner of that file. In other words if there are no owner for a resource that resource is accessible any one. The owner of the file, at his discretion, grants/denies access to the resource he/she owns. DAC has a number of inherent risks mainly because there is no centralized administration. Considering that each file owner controls the access to the file that they own and that not all owners are equally security aware, this model often leads to inconsistencies in the implementation of DAC. 4) What is Mandatory Access Control – MAC? Mandatory Access control is not discretionary or optional. In this method of implementing Access control, all resources are provided with a security label. Access to that label of information is based on the requestor having the clearance (same security label) to view the resource. This model is also called multilevel access control because it classifies resources into various levels and access to those resources requires that the caller has the permissions levels to view/access the resource. MAC is usually used in scenarios that require high level of security like for example defense related information, etc. 5) What is Lattice based Access control – LBAC? I. Given two objects having different security classifications what is the minimum security label that a user must have to access both the resource. II. Given there are two users, what is the maximum security label possible on the object such that both the users can access the resource. 6) What is Rule Bases Access Control – RBAC? The Rule Based Access Control technique is so implemented that any resource request is intercepted by the system and then compared against a set of rules set against that resource before the request is granted if the rules are satisfied. ACLs are example of Rules based Access control implementation. 7) What is Role Based Access Control – RBAC? The Role Based Access control can be regarded as an alternative to the DAC and MAC. In this technique, the access control implementation is done based on the structure of the organization. In this technique each user is assigned a role in the system and each role is in turn assigned a set of rights/privileges. If the role to which and user belongs then they have access or else access is denied to the resource. 8) What are the main Account control administration activities? This is a straight forward process wherein the user accounts are created as and when needed with adequate approvals and removed as soon as the accounts are no longer needed. Account access, particularly the super users and administration, accounts should be logged and monitored. Monitoring helps identify and investigate suspicious activities. 9) How do you determine system level monitoring? • Through segregation of duties and responsibilities. 10) How do you enforce Authorization at the file and data level? Each resource should be assigned an owner who is responsible for maintaining and administering the resource’s rights and permissions. Without owners and custodians, data and objects are not controlled. With ownership, responsibility is defined and users know whom to contact with problems and/or questions. 11) What are the various access control models? 12) What are the main Authentication techniques? 13) What are the various Access control methodologies and Implementations? 14) What is Centralized access control methodology? Remote Authentication Dial-In User is a client server protocol and software that enables remote access servers to communicate with a central server for authenticating dial in users and authorize access to the required resource. RADIUS maintains the user profiles in a centralized database that all remote servers can share. It provides better security, allowing a company to set up policies that can be administered at a single network point. Terminal controller Access Control System is an older protocol usually used in UNIX that allows a remote access server to forward a user’s logon password to an authentication server to determine whether access can be allowed to a given system. TACACS is an unencrypted protocol. TACACS has been replaced by TACACS+ that is built on TCP. 15) What is Decentralized Access control methodology? With decentralized access control methodology user account information, permissions, rights are stored in different computers across the network. Windows NT uses this approach for access control. Domains are large central units of management for Windows NT networks. A domain is collection of computer and user accounts managed by a central authority. Domains help break large network into smaller groups of resources that are easier to manage. Domains are administrative as well as security entities. When the users log into an account they log into a domain, and have access to the resources in that domain, if they have permissions. An account can have access to multiple domains. Users in one domain cannot access the resources in another domain unless the administrators of that domain have trust relationships established between the two domains. A trusting domain allows enables another domain (the trusted domain) to access its resources. 16) What are the general attack types on Access control systems? Yahoo! paranoids note…this is kind of silly! In security world it is regarded as a good practice to disclose as less information as possible to the end user as is just enough to get the work done. A typical example is the case when the user provides invalid logon credentials. Applications ideally should let the user know that the credentials provided are not correct w/o getting into the details of which one (User name or the password) actually is not as required. The message should be such that a malicious user should not be able to deduce which of the two are correct or incorrect– as it simply reduces the attacker’s work to half; he needs to figure out only one component as the application itself somehow tells me which component is correct. 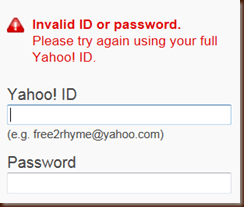 Here is what Yahoo! does when I provide an invalid user id. What I did here is a unintentional typo in the user name. 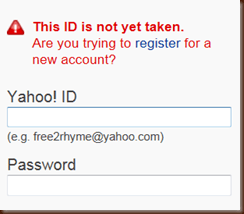 I as an end user now know for sure that the id I am trying to play with is incorrect. The ones with a security hat on can deduce permutations to figure out stuff. While I understand that this is NOT something that affects anyone drastically, but when it comes to setting examples of proper security measures for the end users, it advisable to be thorough, at least with such vanilla stuff. As they say SECURITY IS AS STRONG AS THE WEAKEST LINK.